Jaw dropping at every turn, this is India at its finest! Cows, stray dogs, rickshaws, tuktuks, motorbikes, relentless car horns, bicycles, taxis, people, it’s a miracle how more people are not meeting death in this dusty madness. 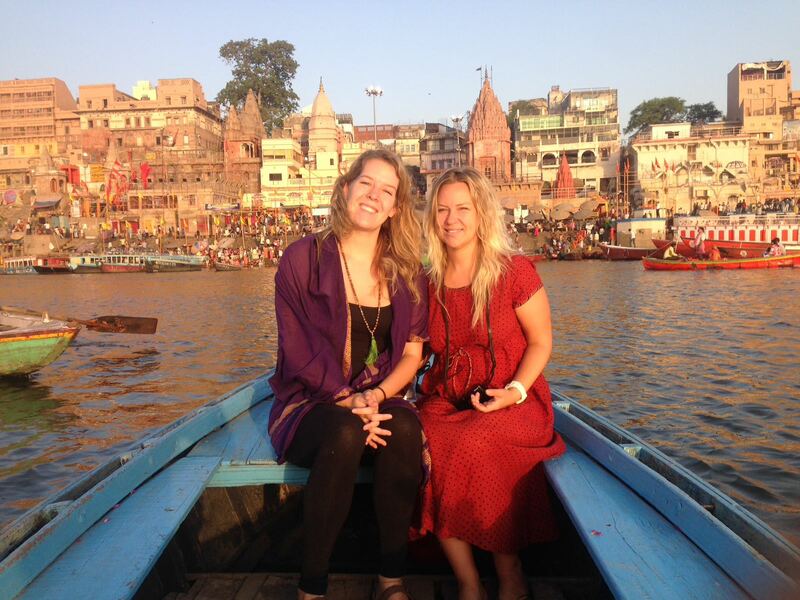 But if there is one place to meet your last moments, its Varanasi or ‘the death place’ as it started to get commonly called during conversations between my sister and I. What is the death part? Hindu’s believe that if you are cremated in Varanasi, your soul reaches ‘moksha’ and is then released from the cycle of life and death. The old mantra, ‘you only live once’ does not apply to most Indians. They believe in reincarnation, and if you are tired of life, you will be free from the torture of returning by being cremated here. 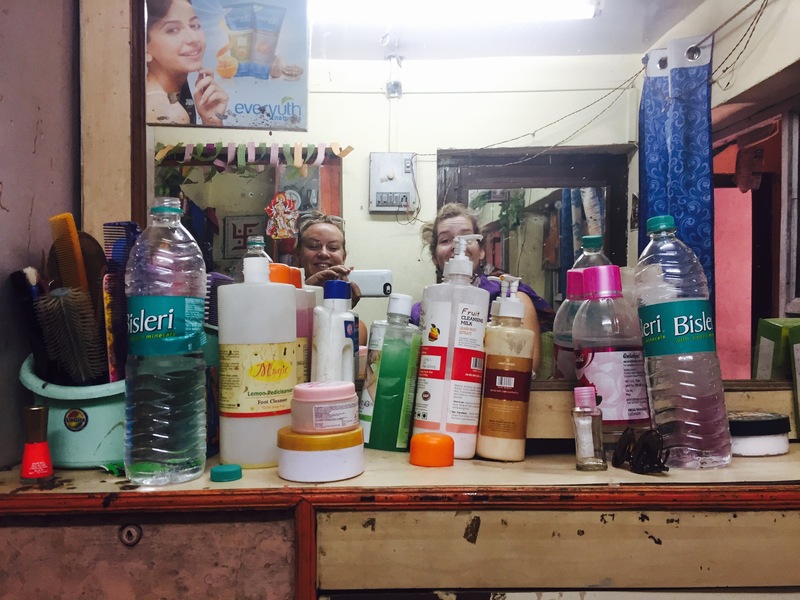 I met up with Dutch travel buddy Nina who I met on the Ashiyana YTT in Goa. I felt relieved to have good company whilst in this somewhat gruelling, but amazing city. On arrival without a plan, we took a boat up the Ganga for sunset. Raj our boat driver, dropped us at Dashashwamedh Ghat we waited for the Puja ceremony whilst shoeing away mosquitos and swarms of snap happy Indian tourists trying to get us in their shots. We had no prior knowledge on what we were about to experience and I am so grateful for this. This prayer ceremony moved me to my core. Beyond powerful. I can’t explain and photos don’t do it justice. I refused to join the phone furore, enjoying it, without the distraction of trying to transport the memory on screen. One afternoon, we were slowly strolling through the maze of little back streets heading to the ‘Ghats’ lining the Ganga banks. Suddenly we were pushed to the side of the narrow lane by men carrying a dead body covered in colourful silk cloth and orange flowers (reminding me of Dia de Los Muertos in Mexico) on a bamboo stretcher. This is not an uncommon occurrence, funeral processions are happening all day, every day in multiple crematoriums on the river bank. Some 400 bodies can be burnt in one crematorium per day, burning bodies, 24/7. Welcome to the death place! 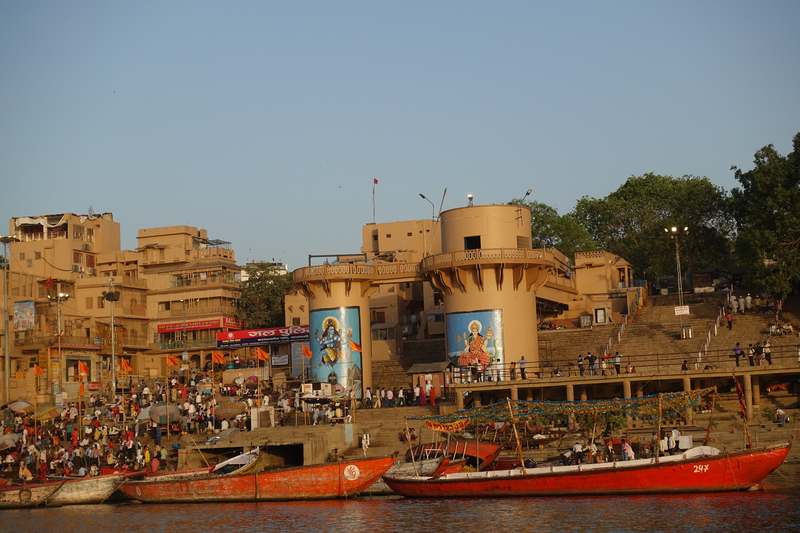 We entered the Manikarnika ghat for the first time, nervous and unsure if we were allowed. I noticed there were no other women or westerners, then we spotted an Israeli man and his son, they spotted us and ushered us to join them and tag along with their guide for a bit. The guide explained that women are not allowed to attend the cremations, because they are considered too emotional. He said it is feared women might get too hysterical and jump into the fire! 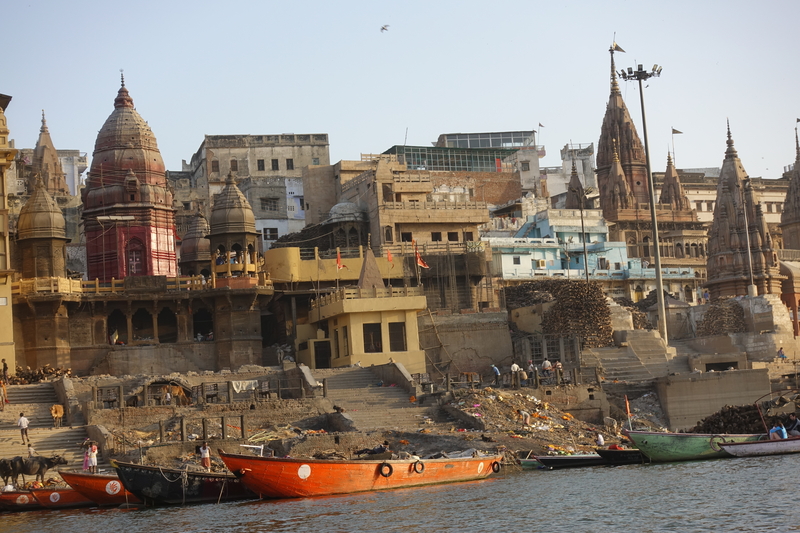 The bodies of women, children and lepers get dropped in the Ganga, they are not considered important enough to burn. Rocks are tied to the body so they sink to the river bed. This is a very different approach to death in Western civilisations where we keep it closeted and private. Here, it is totally out in the open. Bodies are being roasted and toasted by the ‘untouchables’ (the lowest caste,) ashes from dead bodies started to rain down on our heads, at which point Nina decided she would move away from the scene. I was interested to stay in the thick of it and get the feeling of what was happening. 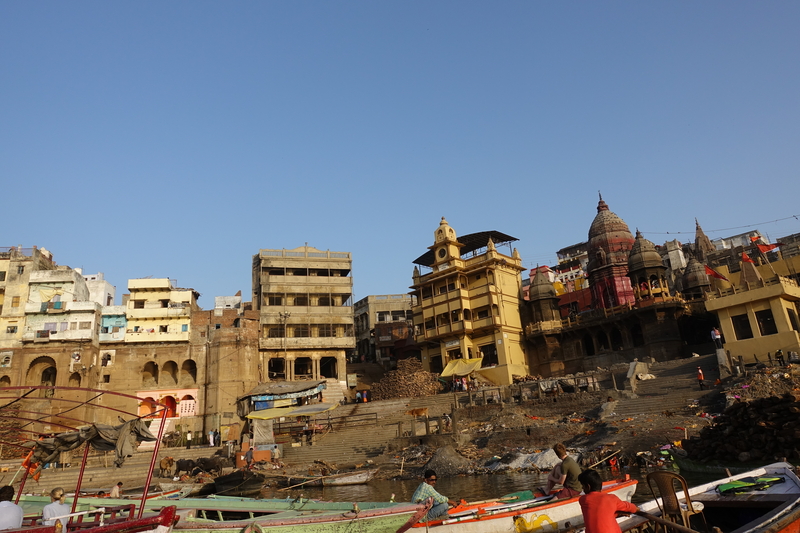 I watched a BBC documentary about Varanasi for research on my Death and Grieving project. I am fascinated to learn about different cultures and their approaches to death. A random Indian man sidled up to me wanting to share his knowledge, for a fee of course, which I was happy to pay. He told me he worked in a hospice for the dying people who make the pilgrimage here for their last days. He pointed out grieving family members dressed in white which indicated to others not to talk with them or bother them. I asked if the men cried, ‘no,’ he said, that was not seen as a sign of strength, a parallel with our culture. He explained a little bit about the preparation of the dead bodies, how a hole is made in the brain otherwise the head will explode. People choose different grades of wood at various prices to burnt the bodies on. There is no doubt, this is big business. I found the energy in Varanasi to be so vibrant, every day felt like a Saturday. The streets were jumping, packed full of people with a celebratory overtone. After all, if you made it here to cremate someone, the belief is they are released into a higher realm and no longer come back to this life of suffering and that is worth celebrating. Death is mostly seen as a morbid and sad thing. Most of us hope to have a pleasant and timely death. And what I mean by timely, is one of an age, when you have left some kind of legacy, in the form of children or career or lasting relationships. And yet, why do we feel like we have a right to any of this? Nowadays we have so much control over health and disease, we feel like we should also have the right to control the time of our death. Most people grasp to this life, afraid to let go, but not everyone is the same. I personally have always felt the impermanence of life and how nothing remains the same. I will always ask myself, if I am not happy or feel dissatisfied, then what can I change? Life can be short and we have no idea of when our last day will be. I wondered about the people who so strongly believed in their Hindu faith and wanted liberation from reincarnation that they made the pilgrimage to be cremated in Varanasi. How had their lives been? I looked around at the westerners like myself and wanted to jump into their minds, how did this make them feel? Are they questioning their own mortality? Are they judging the spectacle around them or open to the cultural differences? 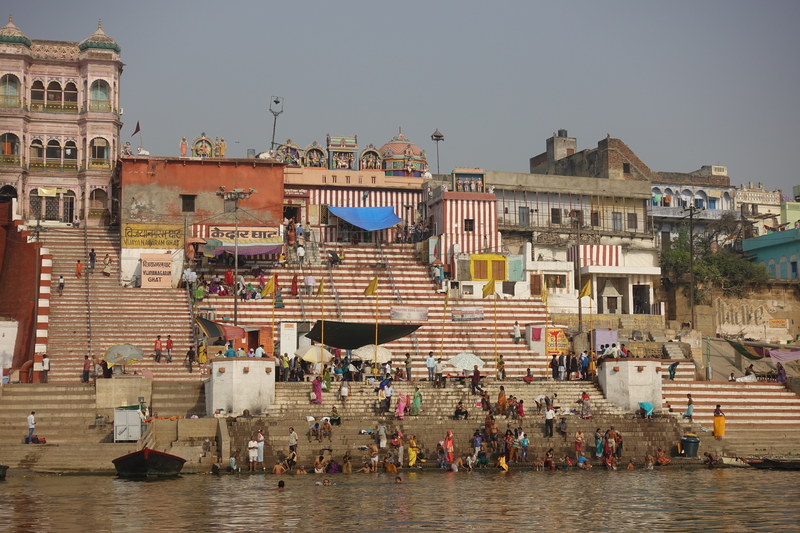 Hindu’s worship nature, the Ganga is a God and it does appear to defy science. A river heavily contaminated by pollution and dead bodies, and yet daily thousands of people are bathing in this water, drinking it, washing their clothes and not getting sick. 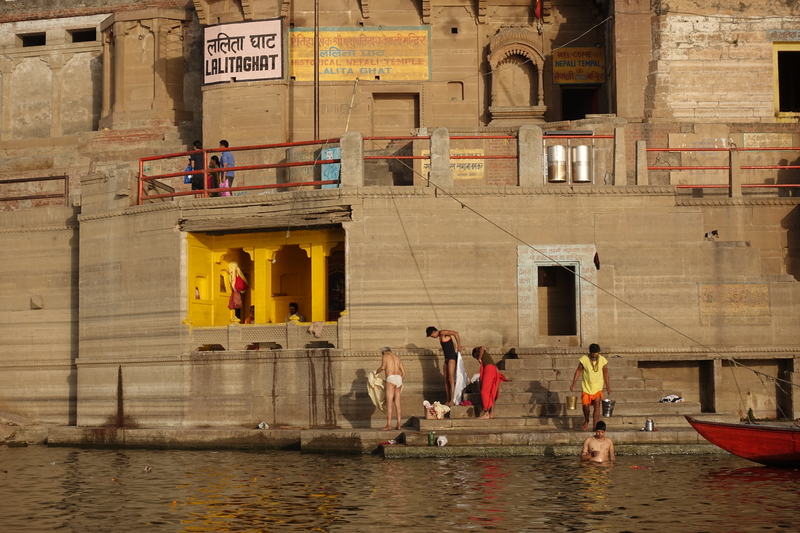 This is seen as the most sacred water in India and it will wash away any impurities or sins. My last morning, I took a final sunrise boat ride with Raj. 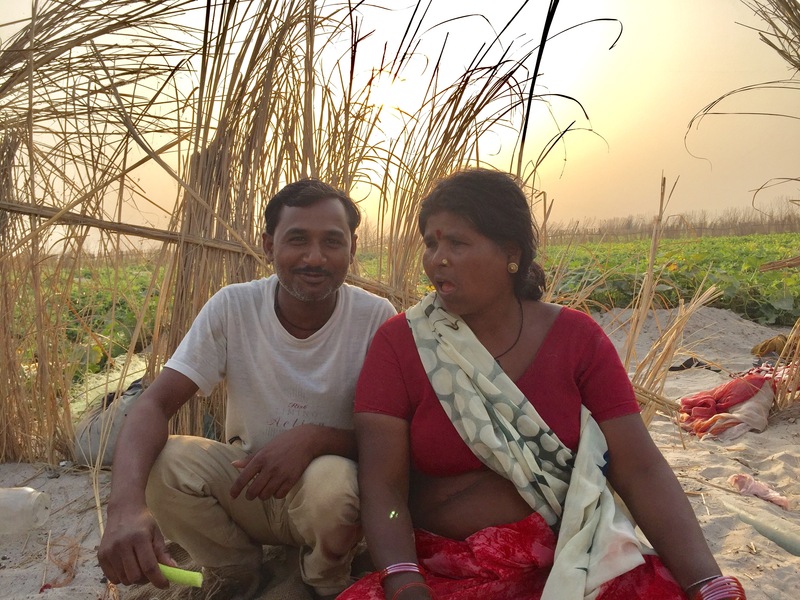 He asked if I wanted to cross to the other side of the Ganga, to the beach. Why not? We moored onto the sand, disembarked the boat and started to walk. Here I go again, wondering off alone into the abyss of nowhere with an Indian man. ‘My friend’ he pointed to a chubby lady, she wondered over to say hello, I could tell this woman had a sense of humour. We went over to her little house and a very large vegetable garden. Then another western lady and Indian boat captain joined us, I felt relieved I wasn’t the only potentially irresponsible white woman. 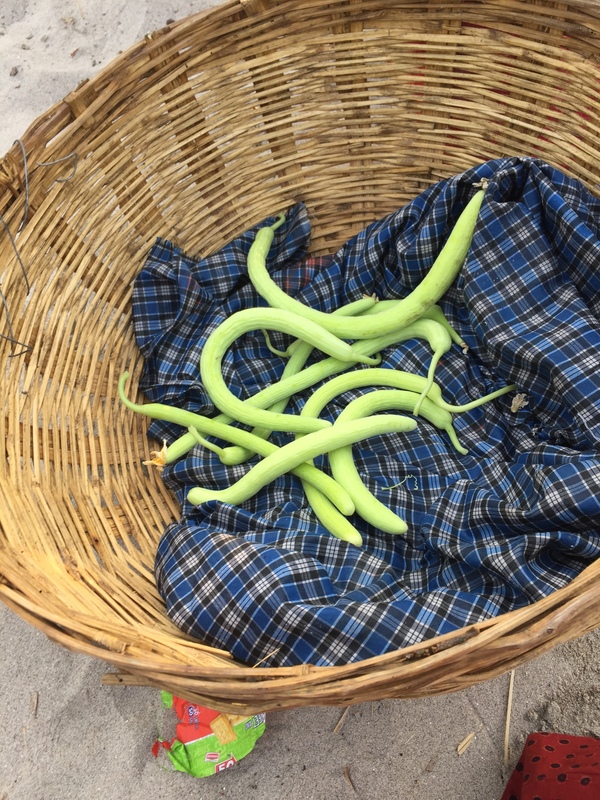 The friendly lady offered us some of her home-grown beans. I politely accepted, and looked at the bean with trepidation. I had not been feeling well, but the people pleaser and taste sensationalist in me took over and I bit into the crunchy bean. We all sat together chatting next to the little straw hut. I couldn’t help imagine how the bean had been irrigated with the Ganga water laden with dead bodies. I prayed to God I wouldn’t get sick. I was shocked to over hear the other white woman was planning on going for ‘a dip’ wow, way braver than me. Nothing was tempting me to baptize in the frothy topped holy death waters, but each to their own. 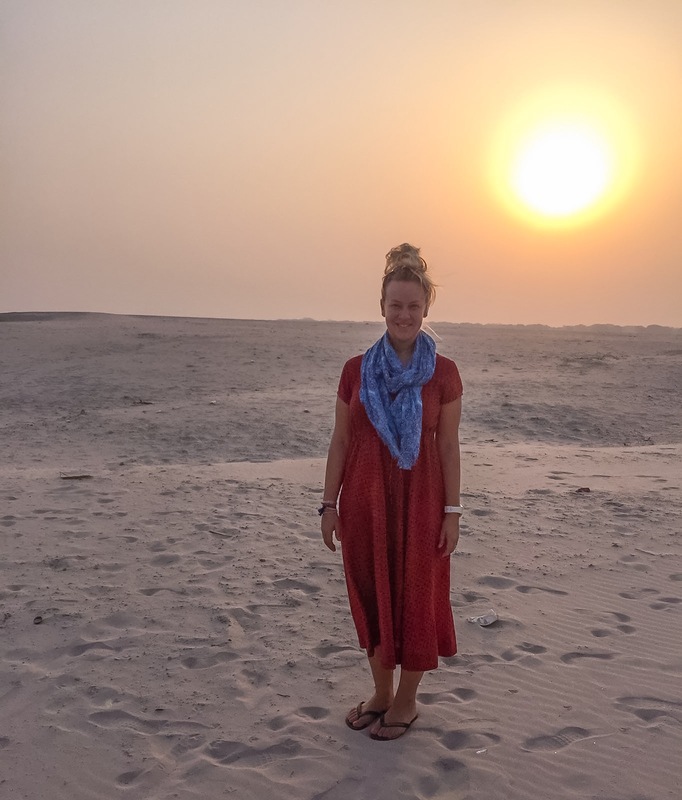 I left Varanasi that day feeling emotional and grateful for that little unexpected memory on the river bank, fortunately I didn’t feel ill after the bean! 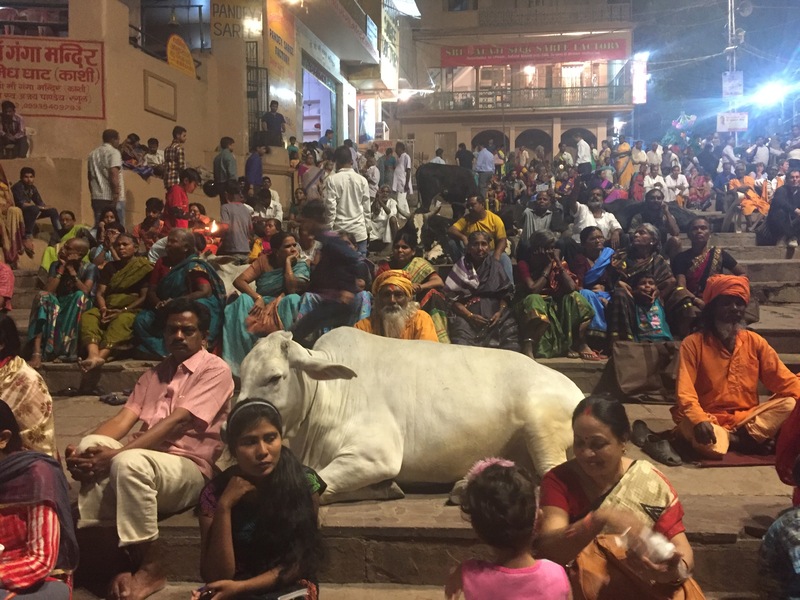 There is a tangible magic in Varanasi. I was bewildered at the traffic chaos and how it all seemed to flow. I couldn’t help wondering about the future of this place, would the government one day invest in restoring the beautiful buildings and it would become Venice of India. I hope not. I hope it will continue to be a rich part of their culture and belief system untapped by western thought and commercialisation. And lastly, I hope they will continue to have boats without engines, the gentle sound of the oars dipping into the water was delightful respite from the relentless dusty road traffic.